Freshly-picked cherries are one of the highlights of the English summer – lusciously juicy and full of flavour. Cherries have flourished in Britain for centuries, but are now sadly in decline, mainly due to competition from imported fruit. Our home-grown cherries have a fairly short season so it’s good to enjoy them while we can, like in this recipe supplied by Tomasz Kulawczyk, the new head chef at Botley Hill Farmhouse. To make your pastry, sift the flour into a large bowl then use a knife to cut the butter into it before rubbing it gently with your fingers until it resembles breadcrumbs. Stir in the sugar then add the egg and splashes of milk until you can form the dough into a soft ball. Wrap in cling film and pop in the fridge to rest for 20 minutes. Heat the oven to gas Mark 6, electric 200c/ 180c for fan, then roll pastry on a lightly floured surface and use it to line a 22cm loose bottomed tart tin. Lay a circle of baking paper on top and cover with baking beans then bake for 20 minutes, remove the paper and beans and return to the oven for a further 10 minutes. While the pastry is baking, make the frangipane by mixing all the ingredients in a food processor until combined then, when pastry is ready, spread this mixture over the base and return to the oven for 15 minutes. Remove from the oven and leave until quite cold. Split the vanilla pod using a knife then scrape out the seeds. 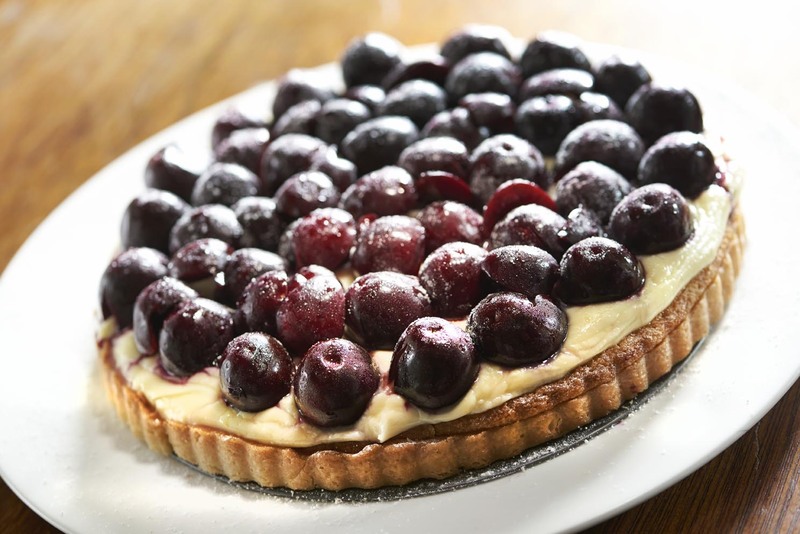 Mix with the mascarpone, lemon juice, zest and icing sugar and carefully spread on top of the cooled tart before decorating with cherries and dusting liberally with icing sugar.